Semaphore is a fine example of the highly distinctive imagery Wadsworth painted during 1935-1938 after he moved away from the uncompromising geometrical abstraction of 1929-33 examples of which were exhibited at the Mayor Gallery in November 1933 and with Unit One, also at the Mayor Gallery, in April 1934. 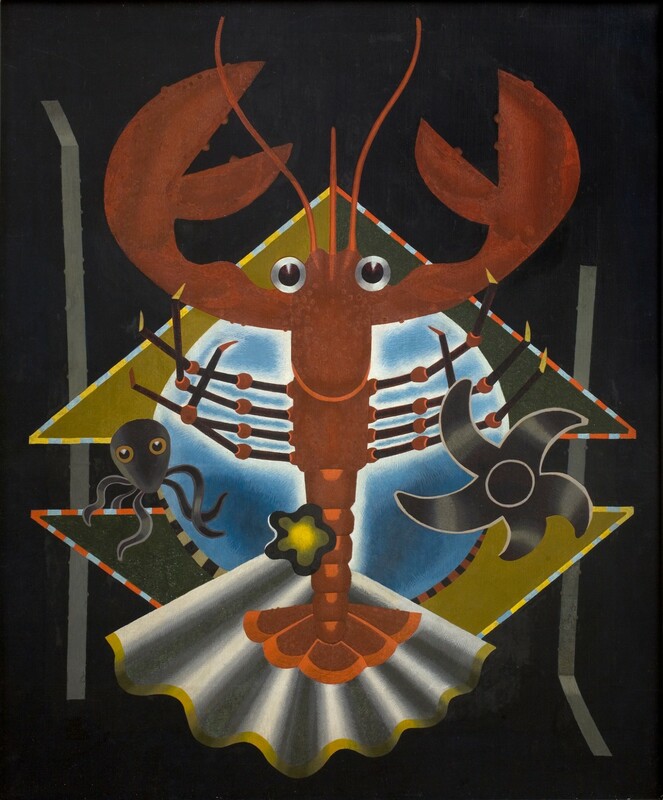 In Semaphore he developed an aspect of his style which anticipates the bold, poster-like directness of Pop Art a quarter of a century later: the rather comedic treatment of the wide-eyed lobster (as if it already knows full-well that it is destined for the pot) and the octopus whose transformation into calamari cannot be far off. A few years later Wadsworth readily agreed with his friend and fellow painter Richard Eurich that the best avant-garde art shared aspects of contemporary poster design. He also felt that modern art should always leave room for a little understated visual humour; what he referred to as “a little flesh on the bones.” The year before he began work on Semaphore, Wadsworth produced four poster designs for London Passenger Transport Board which advertised the museums of South Kensington. By this period he was also friendly with some of the most talented poster designers of the day working in Britain such as Edward McKnight Kauffer, Frank Newbould and Laszlo Moholy-Nagy (who was very impressed by the still-lives he saw during a visit to Wadsworth’s East Sussex home, Dairy Farm, near Uckfield, during the summer of 1936). The composition of Semaphore contains both elements which hark back to earlier works in the artist’s oeuvre, such as the stylised children’s toy plastic flower (such as Picnic, 1929, Private Collection) and the cake frills (first seen in the foreground of Wings of the Morning, 1928-29, Private Collection), and those anticipating the content of some of the later compositions such as designs produced during the Second World War II to advertise ICI products and Octopus (1947, Private Collection). The juxtaposition of natural and man-made objects and of unusual shapes has a distinctly surreal edge to it, although the artist stoutly denied at the time that he was a Surrealist (he had been invited to exhibited at the celebrated International Surrealist Exhibition held at the New Burlington Galleries in June 1936 but had declined to participate). However, at the time of painting Semaphore he had recently befriended the leading British surrealist artist Roland Penrose – they shared a love of the good food and wine and of the South of France. Wadsworth would have been amused at the reaction of Penrose the gastronome to encountering such an impressive lobster. How should it be cooked and presented for maximum epicurean enjoyment?